Categories: Jokes | Tags: Amazon.com, paper is not dead | Permalink. “Hey, excuse me?” The words were spat out more like a command than a question. I looked up from my desk and into the eyes of an angry woman, her hands balled into tight fists on the counter. Of all the women who exercised at the health club, she was the most peculiar. She dressed like a pioneer, yet chatted on an iPhone. Her face wore a permanent scowl, making her look older than she was. She always came in clutching church literature to hand out. I was shocked. The songs played were instrumental aerobics beats. The volume was even below moderate. I managed to smile while searching for words with which to respond. But it didn’t matter; she was already stomping away, shaking her head. I simply changed the CD to praise music and then fell back into my chair to think. I was looking down on the woman because she wanted to hear Christian music and because she was rude about it. How were my sins any less? My self-righteousness and contempt were greater. The next time I saw her coming, I changed the music before she could ask. She smiled and even thanked me. Over months, this simple ritual evolved to small talk to conversations. And I now have a better understanding of who she is. Thank God for His lessons and for a new friend. Categories: Weekly Readings | Tags: judging others, making friends, Matthew 7:3, self righteousness, turning the other cheek, Valarie DeLaVega Morse | Permalink. The room was quickly flooded by an angry wave of intense murmuring. How dare he say such a thing! As if any woman, desperate to have a child and yet unable to have one, would be to blame. A thousand rude comments clogged my throat as I clamped my mouth shut—which is very unusual for me. I spent the rest of the study time stewing over this Neanderthal’s comment. But then I started to really think about the fact that Elizabeth had no children. What could have been the reason? I know that medical issues could easily explain this, but just follow my train of thought: In verse 6, Luke says Zachariah and Elizabeth were “righteous in the sight of God.” Maybe Elizabeth’s barrenness was part of God’s plan all along. I mean, let’s be honest. Parents with many children parent differently from those with just one or two. God chose Elizabeth and Zachariah to be the parents of a very special person, the one who was to pave the way for His Son. This person was to begin softening the hearts of God’s children. To be aptly prepared for the job, he would require a solid foundation in his early, formative years. He would need the undivided attention of parents who had the time to bring him up to fulfill the job description of his career. Just think about the man that John the Baptist became. He was a true believer, a dynamic preacher, and a great leader of his time. Elizabeth—having been barren for so long, having matured along the way, having watched the errors of young mothers—had a huge advantage. She didn’t have other children or responsibilities to distract her. Both Zachariah and she were at a point in their lives where they could fully embrace God’s plan and focus all their time, resources and energy on bringing up John to fulfill the prophecy of a messenger. And this may not have been the case without Elizabeth’s barrenness. Think about this the next time you find yourself praying for that one thing you need to fulfill your greatest desires. Never put your limits on God. He has amazing plans for you in His time. Categories: Weekly Readings | Tags: Alabaster Jars, answered prayers, Cynthia Ward, daily devotions, John the Baptist, Luke 1:7, Open Mouth Insert Foot, Zachariah and Elizabeth | Permalink. The bright green, fresh and tender okra brought back memories of standing on a footstool and sharing a kitchen counter with my mother. As I rinsed my okra, I remembered instructions and warnings drilled into me—all specific to cooking okra in India. 1. Always buy twice as much as you need because half will definitely be rotten on the inside. 3. Soak the okra in a mixture of bleach and water to exterminate e coli and its distant relatives. 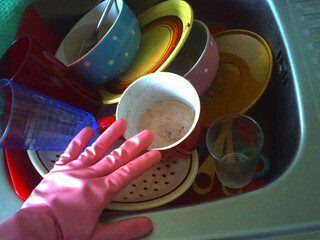 Then rinse and dry every single piece with a clean, dry towel. 4. Slit every okra lengthwise and carefully examine the innards for worms and weevil droppings. Ones with even the tiniest hint of anything foreign resulted in the entire okra tossed in the trash. Saving the unaffected portion of the okra was not an option in my mother’s kitchen. And looking for worms and droppings was my job. I was very good at it—probably out of fear that my negligence might poison the family! It wasn’t an easy task either. It wasn’t something I could multitask while listening to music or talking to a friend. The okra required my undivided attention. Okra worms are masters at camouflage. They curl and entwine themselves around the inner ribs and tunnels with their little heads looking just like the creamy white okra seeds. And you have to look really closely to identify the tiny grey dot of a mouth that differentiates the worm from the okra seed. All this training came back to me as I prepared my okra. I really wanted to fry them whole, but I just couldn’t bring myself to do that. So I did like I was six again. I began slitting each one lengthwise and carefully examining it for worms and droppings. One by one, over and over. About half way through and having found no worms, I objectively and rationally realized I needed to stop with the craziness. But, I simply couldn’t. I continued, until I checked every single okra in the bunch. The whole thing got me thinking. This is how I am in life. I have a major case of the okra syndrome. I remember the details of every time I’ve been burned, hurt, taken advantage of. And I go overboard with preemptive measures, making certain I never have a worm or weevil dropping in my life again. Categories: Weekly Readings | Tags: daily devotion, humor, life lessons, okra, paranoia | Permalink. It was a time when nothing seemed to be going right. His health was in crisis, his marriage was falling apart and his business was struggling. A man of faith, Bruce turned over his problems to the Lord. He prayed, he meditated on God’s Word, he exercised faith at every turn, he surrendered to God’s will. But he couldn’t shake the heaviness of his problems. It hovered over him. Then one day while praying, he realized that it wasn’t enough to turn everything over to God. He needed to find a way to praise God for his problems. He needed to live like he really believed that “all things work together for good to them who love the Lord.” And that’s when his problems took a back seat in his life. And that’s why he is able to say his cancer was a blessing. There’s the kind of faith that helps you to stoically wait for God’s plan to unfold, so you can see in hindsight that everything that happened was meant to be. Then there’s the dynamic kind of faith that does more—It is an active agent that enables you to laugh and live and rejoice during your trials. Most all Christians have the first kind of faith. But those who have the second kind live every day with the rush of contentment and peace. It was this second kind of faith that allowed Job to chastise his wife with the words, “Shall we accept good from God, and not trouble?” (Job 2:10). Categories: Weekly Readings | Tags: cancer, devotional, encouragement for women, Fylvia Fowler Kline, Job, Job 1:21, Job 2:10, positive attitude | Permalink.